Have you ever felt sick and tired...of feeling sick and tired? If you answered yes to that question, you might have fibromyalgia. For longer than I can remember, I've been intermittently feeling tired, achy, run down, etc., and I've been seeking medical answers to explain why I feel this way. The good news is, I'm healthy as a horse. At least according to the numerous blood tests and non-fun procedures I've gone through. The bad news is, I found out I'm suffering from an autoimmune disorder called fibromyalgia. If you're not familiar with fibromyalgia, it's a hard to diagnose disorder with symptoms ranging from headaches, to sweatiness, to aches and pains, to tummy troubles, to memory loss, and everything in between. My first real clue that anything was wrong was early this year when I went to get my hair cut and my stylist pointed out a fairly large bald spot on the back of my head. A doctor friend of mine convinced me that I had a fungus on my head (I didn't), so I went to the doctor to get it checked out. My general practitioner took one look at my head and said, "you have alopecia areata, or a condition that causes patches of hair to fall out." Sweet. My next step was to have a dermatologist check out my head. She confirmed that I have alopecia and started me on a series of hair regrowth treatments which consists of multiple injections of steroids to the head. Giddy up. There's no feeling quite like having a needle jabbed into your scalp. I'm not sure how people get tattoos up there, either. Ouch! I'm a self conscious person to begin with, so...losing hair was really traumatic for me. Thankfully, I have thick hair and the location of my spots makes them easier to hide, but it's still quite the blow to the ego to be a balding woman. A few months later, I happened to be at my gyno's office talking about my tale of woe and feeling awful the majority of the time when he suggested I see a homeopathic doctor who specializes in treating chronic fatigue syndrome. At this point, I'd seen so many other doctors, I might have considered eating a steak if it would make me feel better, so I made an appointment to see a man named Harold Bowersox. Of course I googled him to see what people had to say about him but I found very little info. (more people should review doctors online, IMHO) I did find a book that he'd written about fibromyalgia and chronic fatigue syndrome. I ordered it and read it in about a half hour. It contained a lot of testimonials from people who had symptoms like mine who were able to feel better within months of seeing Dr. Bowersox, so I was cautiously optimistic. I showed up for my appointment not knowing what to expect. I'd read that Dr. Bowersox was trained in traditional medicine but focused more on homeopathic treatments. I'm not really into pill popping, so I figured trying natural remedies really couldn't hurt. The doctor reminded me of a tv grandpa. Sort of soft spoken but wise. He spent an hour with me getting my medical history and talking to me about my life. It almost felt like a therapy session. Towards the end of the exam he examined me and looked at my bald spots. He did some quiet thinking and then told me that he thought I had fibromyalgia but if I was willing to follow his protocol, or treatment plan, most likely, I would feel better. Although it wasn't covered by my insurance (growl) and cost me $350 for a month's supply, I figured it was worth a shot. 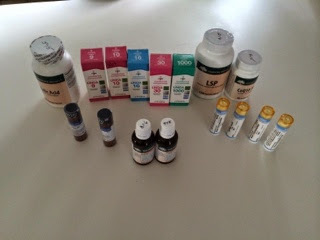 I was given crystals to dissolve under my tongue, supplements to take twice a day, and liquids to take 3 times a day. They're all natural, and are made from plants, flowers, and other things you generally wouldn't think to put in your mouth. The medicines promised to help with everything from insomnia to hair loss. To be honest, I had very low expectations for this treatment plan. Traditional medicine hadn't worked, and I doubted that the medicine this nice doctor in Mentor, Ohio was pushing could help, either. But I was wrong. I didn't begin to see results immediately. It took me around 3 weeks to notice that anything had changed. I was starting to have more good days than bad. My stomach issues completely disappeared. I was able to run again. I went back after a month of taking the Bowersox Protocol and the doctor told me he was impressed with my progress and to take another month's worth of medicine, with a few extra things added in to help me sleep and to help with headaches. He also explained that some people see only minor improvements in the first month, but months 2 and 3 show lots of improvement. The ultimate goal of this treatment plan is to basically reboot your body and start over. If all goes as planned, you can stop the Protocol after a few months. As I type this, I'm 1 month and 2 weeks into treatment. And I feel SO much better. Sure, I still have the occasional day where I have no energy, ache, and have trouble getting out of bed, but they're rare now - not a daily occurrence. I can eat a meal and not get sick. I can sleep through the night. I don't have to take Aleve every day to battle aches and pains. It's really quite incredible to me. In the past 2 weeks, I've run in 2 races. A month ago, I didn't even think I'd ever be able to run again. This protocol has given me my life back. I hope to see continued improvement as I continue down this natural path. I just wish this type of treatment was covered by my insurance. It seems ridiculous to me that I can get sleeping pills, pain medicine, and other "masking" drugs for almost free through my insurance...but a natural alternative isn't covered. I've joined fibromyalgia groups on facebook and I'm amazed to read about the massive amounts of medicine other fibro patients take. I know out health care system is a money making machine, but I wish there was more emphasis on making people well and not just doping them up so they can get through the day. I could rant about that all day, but I won't. I'll just say that if you aren't feeling well, you might want to give homeopathic meds a try. All you have to lose is money. And you might just find your way down a path of wellness and free yourself from taking prescription drugs for life.